Yes, zucchini and raisins with a touch of garlic and Parmesan cheese – a marvelous combination on pasta or pizza. Zucchini adds texture and color to the garlicky-salty flavors offset by sweet raisins and a zing of lemon zest. I first tried this on pizza when Sun-Maid asked for several raisin pizza recipes. (Raisins are surprisingly good on a Margherita pizza too). Then I recently transferred the flavors to pasta in this quick and satisfying one-pan recipe. Give it a try and let me know what you think! Cook pasta in boiling salted water per package directions. Drain. Remove strips of lemon peel with a vegetable peeler. Finely slice the peel into 1-inch long shreds to make about 2 tablespoons. Reserve lemon for another use. Heat olive oil in pot used for pasta over medium heat. Add garlic and stir 1-2 minutes until garlic just starts to turn golden brown. Add lemon peel, zucchini, raisins, nuts and salt. Stir over medium heat until nuts are lightly toasted and zucchini is tender-crisp, 1-2 minutes. Rinse pasta briefly with hot water if it has become sticky. Return pasta to pot and stir to combine. Serve immediately with Parmesan cheese. 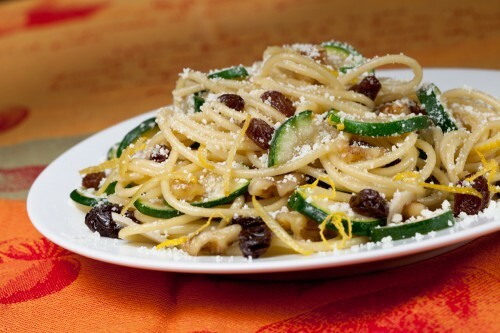 I love the additions of the lemon peel and raisins in this pasta dish. Very cool idea, Rosemary! Lemon and raisins are a wonderful combination with Parmesan cheese! That combo of sweet and salty (raisins and Parm) reminds me of a salty cheese drizzled with honey as an appetizer. Yes, that’s a similar flavor combination, equally surprising and delicious!